In response to Louisiana Governor Edwards’ plea for faith-based organizations to respond to the state’s recent flooding disaster, The Church of Jesus Christ of Latter-day Saints is expecting to bring as many as 9,400 “Mormon Helping Hands” volunteers, over three weekend periods, to help families clean out affected homes. Members are traveling from Texas, Arkansas, Mississippi, Tennessee, Florida, Alabama and Louisiana to give assistance by removing from houses damaged sheetrock, flooring and debris caused by the flood. 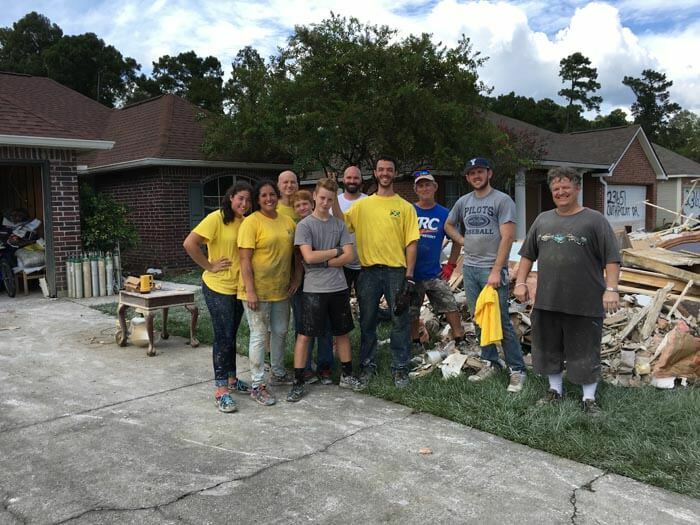 Volunteer members from the Daphne congregation, including three generations of the Boxx family, and two from the Evans family, form a work crew to work on flood damaged homes. From left: Ashlan Evans, Anne Evans, Greg Boxx, Zachary Boxx, Matthew Boxx, Edward Brewer, Chris Silva, Mark Boxx, Tanner Klippel and Fred Christensen. A further 4,000 volunteers from the six southern states have committed to travel to the affected areas Labor Day weekend, reaching the total of 9,400 church member volunteers, that have answered the call to help the Louisiana flood victims. For more info about Mormon Helping Hands visit http://www.mormonnewsroom.org/article/helping-hands.